Would you like the chance to win a weekly cash prize of £1500? 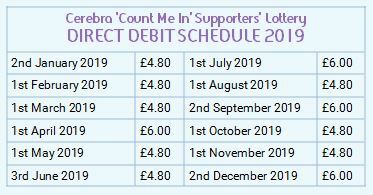 Supporting Cerebra by joining our ‘Count Me In’ lottery is a fun way of donating and helps families that include a child with a brain condition to discover a better life together. You can join Cerebra’s Lottery in weekly blocks-this allows you to play every Thursday for £1.20 a week. Buying a 10 week block costs £12 or joining for one year and playing in 52 draws is £62.40. You can buy more tickets which will double or triple your chances of scooping the weekly prize of £1,500 by contacting the lottery office on 01267 244218. By joining the lottery you’re helping to provide Cerebra with a regular, sustainable income which allows us to plan for the future-ensuring that we can continue helping children with brain conditions now and in the future. Please remember that it is an offence for any person under the age of 16 to play in a lottery. Why not spread the cost and join up to play by Direct Debit. We collect in blocks of four/five weeks each month (£4.80/£6.00), helping you to budget and ensure continuous play (see the collection dates and amounts below). Your valuable support for our vital work is just £1.20 a week a makes a massive difference. Complete your details below, click how many tickets you’d like to play each week and then click Next to enter your bank details. Your payments are covered by the Direct Debit Guarantee. Call our Lottery Helpline on 01267 244218. Join today – you could be a winner! Tickets cost £1.20 each per week. Direct Debit payments are collected on a monthly basis. A confirmation letter along with your unique ticket number and Direct Debit schedule will be posted to you.